There are a lot of things to consider in the chart below, but as a manufacturing guy, I believe that the strong economic performance by Germany, compared to Ireland at the current moment, might be partly explained by Germany’s strong apprenticeship programs, as opposed to sending everyone off to University. Q: Who would have thought of “Post Secondary Educational Achievement” a possible negative economic indicator? A: Professional Journeymen in the trades, perhaps. 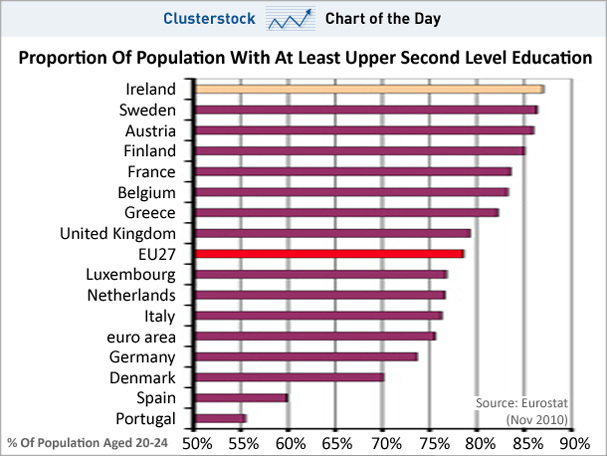 So why is the German economy, with its relative lack of large numbers of well educated citizens in the 20-24 year old age group so far ahead of Ireland? This entry was posted on Thursday, December 2nd, 2010 at 4:12 am and is filed under Front Office, Shop Floor. You can follow any responses to this entry through the RSS 2.0 feed. You can leave a response, or trackback from your own site.